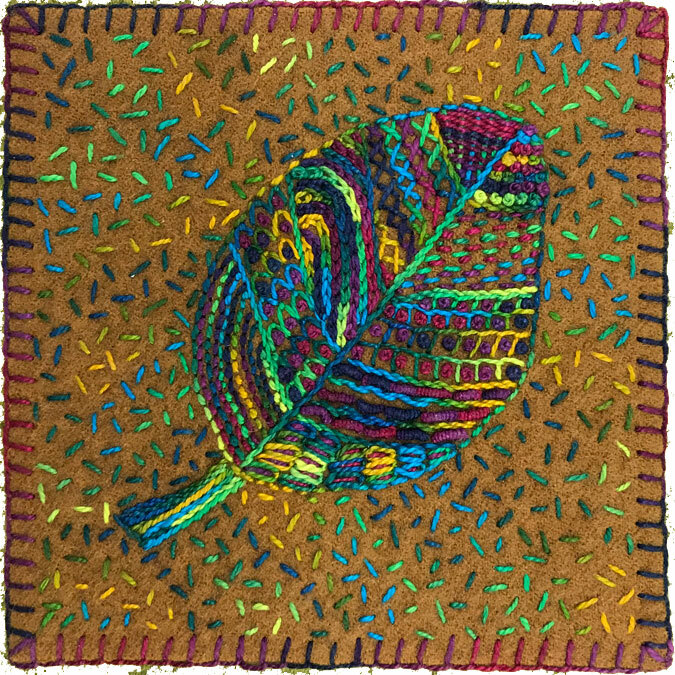 Free-Form embroidery on wool by Sarah. Thank you all for leaving comments for the wool scraps give-away. It’s always fun to hear about you’re creative plans. We all have such active imaginations that must be nourished with art making! 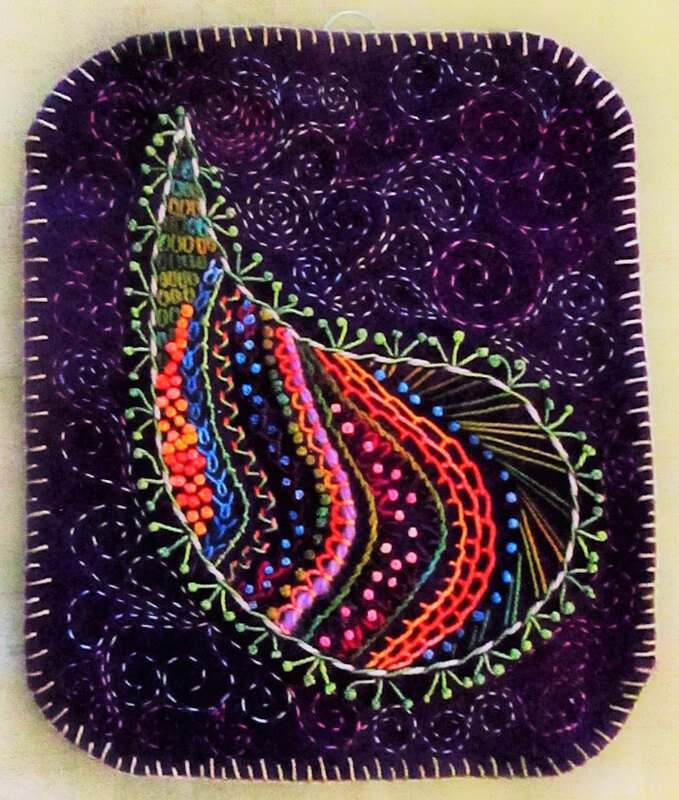 And speaking of creativity, isn’t this embroidery by one of my students beautiful? Thank you Sarah for sharing your artwork with us. And now for the lucky winner of the package of wool scraps. I’ll be sending it out to: Jackie of Colorado. Thank you all and keep on stitching! Susan finds needlework very “grounding”. And I couldn’t agree more! Her interpretation of the project warms my heart. 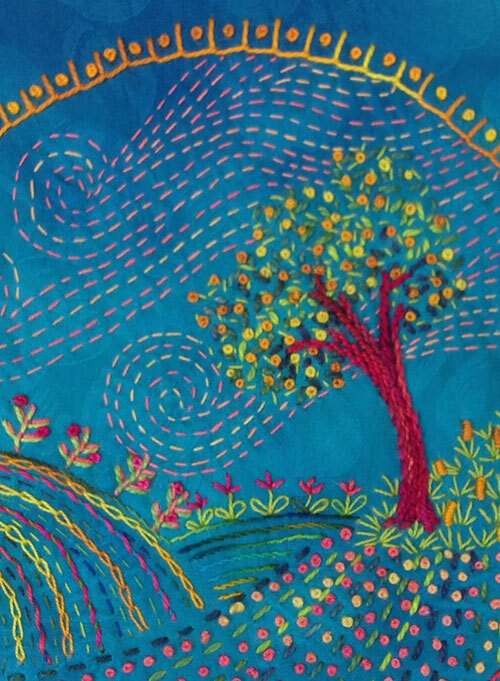 It makes me so happy to see embroidery work from around the world whether from big or small islands. Thanks Susan for sharing your work with us! Fantasy Flowers by Joan B. 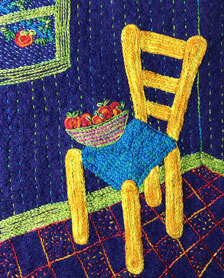 My guest artist today is Joan B. I really enjoy seeing the finished projects for classes I teach. And Joan’s is especially appealing because of her innovated binding and hand stitching that enhances her original design. 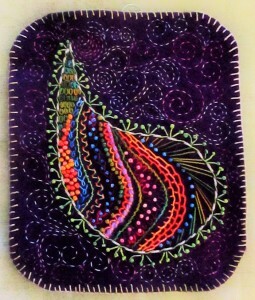 Joan started her artwork in my Fuse Your Bloomers workshop. You can find more of her work on her Etsy shop – JBsCreativeQuilts .. Here’s a link – www.etsy.com/shop/JBsCreativeQuilts. Joan also keeps busy with presentations to quilt guilds, teaching quilting classes, and creating custom quilts – especially t-shirt quilts – for clients. Thank you, Joan, for sharing your artwork with us! Love at First Stitch by Elizabeth S.
Thank you so much for the positive feedback on my new book, Joyful Stitching. I’m so glad you are enjoying it. And now you are sending me images of your work inspired by the book. Wow! 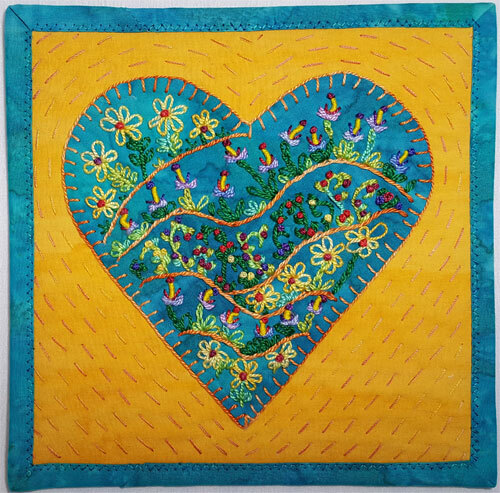 Here you see a beautiful heart stitched by Elizabeth S. on cotton fabric. It was inspired by the Love at First Stitch project from the book. Elizabeth says this: I really like that you encourage people to do what they feel like doing. Your designs are fun and creative and you give enough instructions so that people who want to duplicate them exactly can do so, but you give permission to change things up, too. Elizabeth, you have hit the nail on the head. 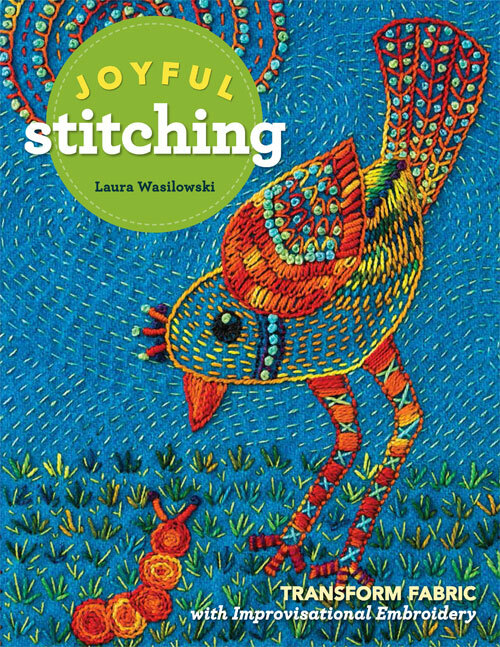 The whole point of the book is to give you a starting point, a method of working, and the tools to create even more stitch work. Above, you’ll recognize Elizabeth’s version of the Rare Songbird project. She made it as a gift for a coworker and says: I like my little spotted caterpillar. I had grass tufts like yours but with a little too much space between the rows so I filled the gaps with random stitches….. This was a fun project. I will probably make more fabric postcards, some with your designs and some just doing what I feel like using your stitches and ideas. Thank you for sharing your work with us, Elizabeth! And now the the Give-Away part! Leave a comment on my blog today and you may be the lucky winner of my new book, Joyful Stitching. The winner will be announced next Thursday.